TORONTO, Oct. 22, 2013 /CNW/ - Newfoundlanders have something to be proud of this morning as the winner of the Lay's Do Us a Flavour contest is announced. Canadians have voted and Lay's fans across the country have crowned Maple Moose as the next great Lay's potato chip flavour in Canada. Created by Tyler LeFrense of Isle Aux Morts, Newfoundland, the Lay's Maple Moose flavour will be re-released into the Canadian market in late November. Newfoundland's LeFrense was surprised at his Isle Aux Morts home yesterday morning when he received a call from the Lay's team informing him of his big win. In addition to earning the bragging rights of having his flavour join the Lay's line-up of Canada's favourite potato chip brand, LeFrense will receive $50,000 plus one per cent of future sales of Lay's Maple Moose potato chips. "I can't express how excited I am about this big win," says LeFrense. "The flavour was inspired by two great Canadian icons - moose and maple syrup - and I'm so glad that people loved it as much as they did. It's been a thrilling experience, from having my picture on the Lay's Maple Moose bag and knowing it would be sold across Canada, to being part of a contest that was promoted by Martin Short. Thanks to everyone who got behind my flavour and voted to make this win possible!" All across the country, Canadians answered the call to buy, try and vote - resulting in all four finalist flavours selling beyond expectations as Canadians sought to become informed voters. Fans nationally rallied behind the finalists and their favourite flavours, taking to Twitter, Facebook and local media to show their support. The buzz about the four finalist flavours also extended beyond Canadian borders and caught the attention of a number of U.S. media outlets. In the end it was Maple Moose that won over the hearts, taste buds and votes of potato chip lovers nationally. Voters in the winner's small Newfoundland town of 600 and surrounding communities rallied together to show their pride and support their chip candidate. Local mayors and MP's also got behind Tyler with letters and kind words of encouragement. The flavour not only uniquely represented Canada, but the tradition of outdoor cooking and flavour experienced during cool autumns on the east coast. 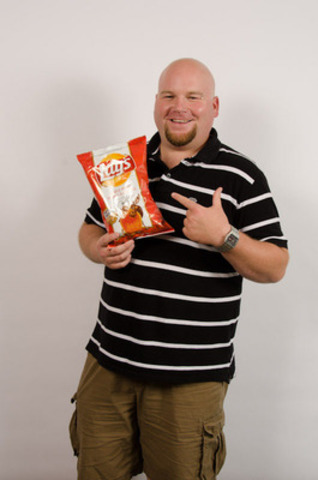 "We're thrilled with the overwhelming support we've received for the Lay's Do Us A Flavour contest." says Susan Irving, Director of Marketing at PepsiCo Foods Canada. "Canadians nationally showed their passion for the flavours, and rallied behind this uniquely sweet and smoky tasting potato chip. Congratulations to Tyler for earning Canada's votes and taking top honours!" she added. LeFrense, already knows what he's doing with the winnings. "I plan to spoil my 3 year-old daughter and pay for my post-secondary education. I'm a Newfoundlander, so I'll also treat myself to a boat!" Back in February, the Lay's brand and comedic legend Martin Short announced the contest and asked Canadians from coast-to-coast to submit their flavour ideas for the chance to win $50,000 plus one per cent of future sales. From over 600,000 submissions, four finalist flavours - Creamy Garlic Caesar, Grilled Cheese & Ketchup, Perogy Platter and Maple Moose - were chosen and released into the market to compete for votes between July 30 and October 16.
and beverages that are loved throughout the world. PepsiCo's people are united by our unique commitment to sustainable growth by investing in a healthier future for people and our planet, which we believe also, means a more successful future for PepsiCo. We call this commitment Performance with Purpose: PepsiCo's promise to provide a wide range of foods and beverages for local tastes; to find innovative ways to minimize our impact on the environment by conserving energy and water and reducing packaging volume; to provide a great workplace for our associates; and to respect, support and invest in the local communities where we operate. For more information, please visit www.pepsico.ca.